Recently I was invited to try out the Eid special set-menu at Royal Tulip, Kharghar, Navi Mumbai. Being a vegetarian, I thought it would be pointless, what would they have to offer to vegetarians. 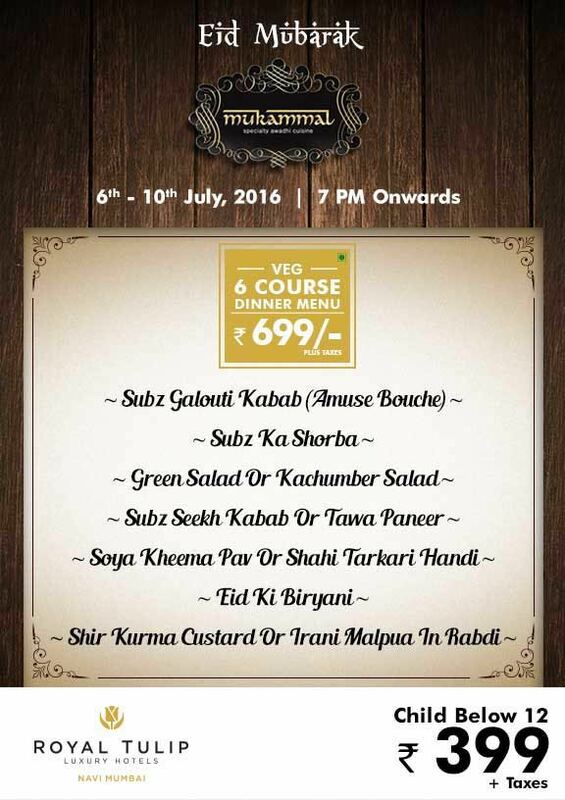 But they assured me that they had an as extensive menu to cater to vegetarians, and I found myself at Mukammal, their in-house restaurant on Eid. 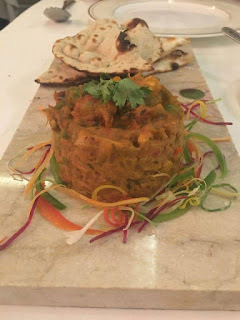 The name Mukammal reminds of romantic bollywood songs, and the restaurant had a very peaceful, calming atmosphere, great for people who like to relish their meals in peace. There were instrumentals playing in the background. The set menu has a few options to choose from, and we went for one option for each of us. 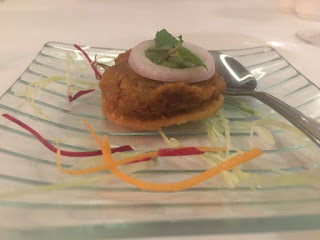 We started off with Subz Galouti Kabab, a welcome dish which had a crisp papdi, on which the kabab was placed, topped with some chutney and a ring of raw onion. This was so delicious, the kabab melted in the mouth and the crispy papdi complimented it. I felt like we could have more of these, but then there was a lot to follow. 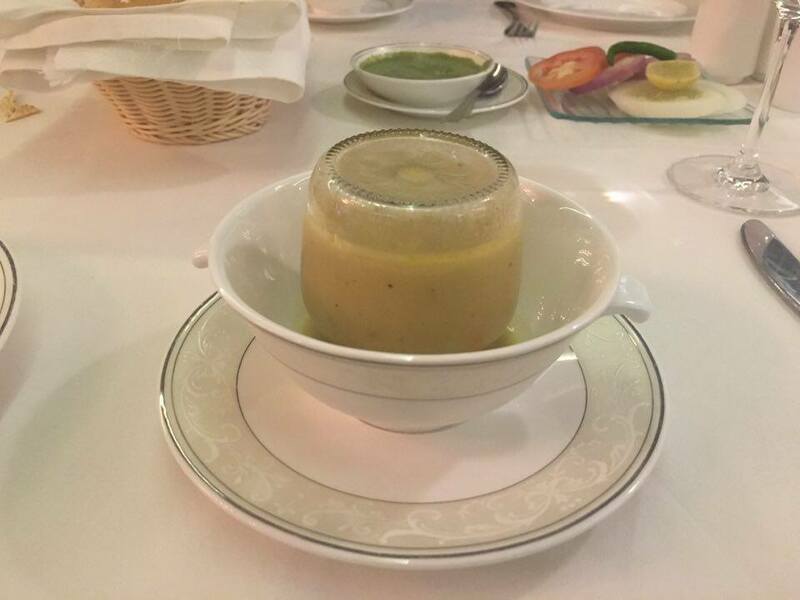 Next we had Subz ka Shorba, which is basically vegetable soup. This was served covered in a bowl, poured in front of us. I guess they do this to keep it hot for longer. The salt and pepper was a little less for our taste, but otherwise it was very pleasant for a healthy soup. 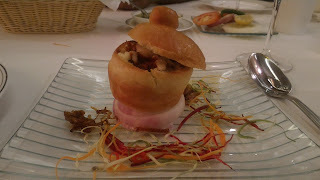 They also served a basket of roasted papad and some green salad. For the starters we had Tawa Paneer and Subz Seekh Kabab. 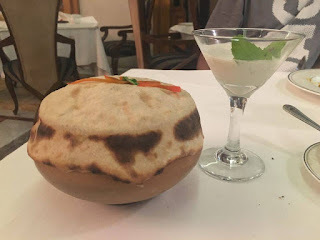 I loved the way the Tawa Paneer was served in the copper utensil in front of us. 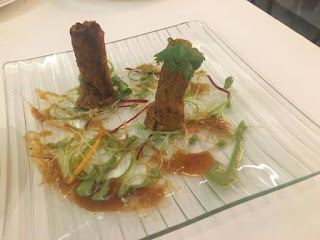 Both the kabab (which tasted similar to the Subz Galouti Kabab) and the Tawa Paneer were very fresh, had the right flavour and were savoured along with some green chutney. For main course there was Soya Kheema Pav and Shahi Tarkari Handi. 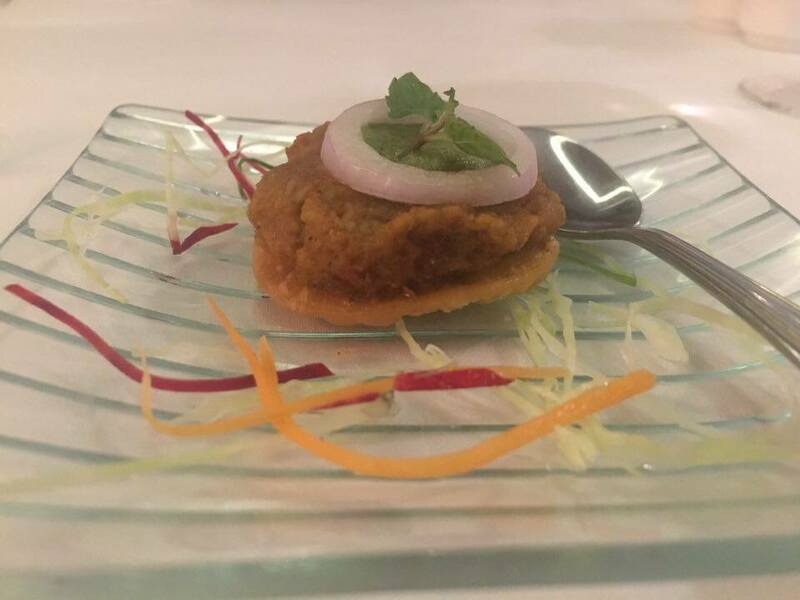 The Soya Kheema Pav looked absolutely adorable with the pav baked like a bowl with a lid! And it tasted soo good, I was thrilled that it was Soya (Made a mental note to try this at home sometime). The Shahi Tarkari Handi was served with tandoori roti and naan, the vegetables were really fresh and now we started feeling full, but there was yet the Eid ki Biryaani and desserts left, how could we say no to that! The Eid ki Biryani was served in such a special way, we were looking curiously. The bowl was covered with roti, which is torn to reveal and serve the Biryani, along with Raita which was served in a glass. The Biryani was perfect, we had been transported to Hyderabad for a bit. Though because we were already quite full, we couldn't finish and enjoy it thoroughly. After all, my favourite part of the course was still left - Dessert! 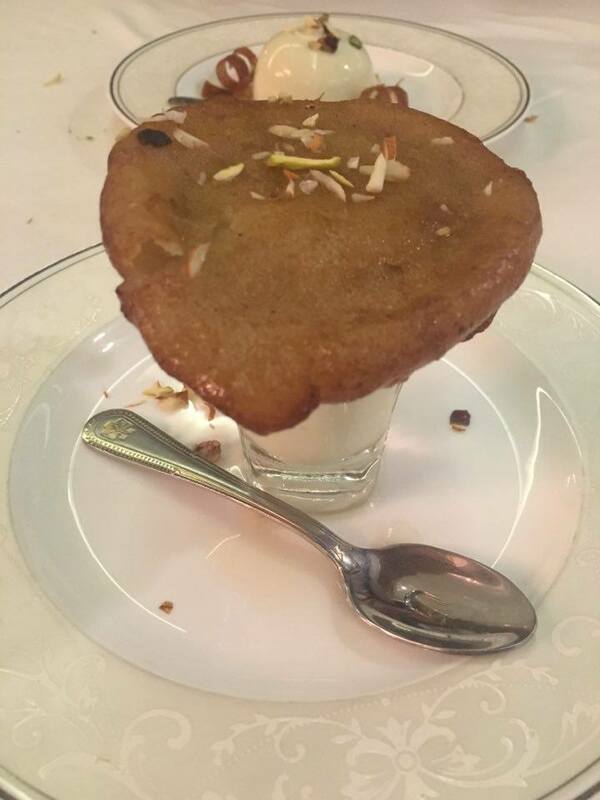 For dessert there was Irani Malpua in Rabri and Shir Kurma Custard. The husband, being an ardent fan of Malpua had already called dibs on the Malpua, and I agreed to the custard. 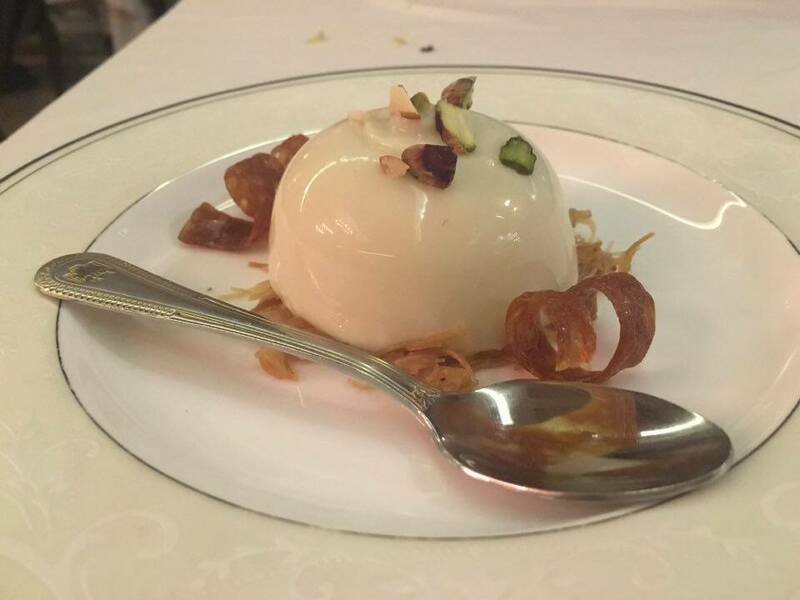 Both the desserts were delicious, though the Malpua could have been hotter. 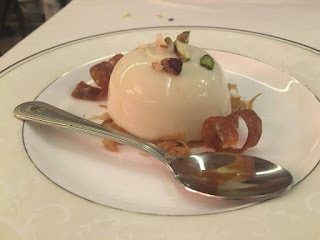 The custard was set to be in a jelly-like consistency, with base of 'sevai', it was a great combination and something different. Reminded me a bit of the honey-noodles dessert you get at chinese restaurants. 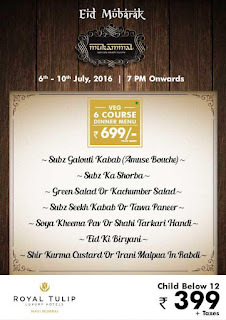 What's most important is, all this at 699 (plus taxes) per head for vegetarians and 799 (plus taxes) for non-vegetarians, it's totally worth every rupee. The chef checked with us a couple of times to make sure everything was okay and if we liked everything. Even the manager rounded all the customers once to ask how their experience was. If this wow'd you, don't miss the Monsoon special they're going to have at 'The Daily Affair', their in-house cafe. 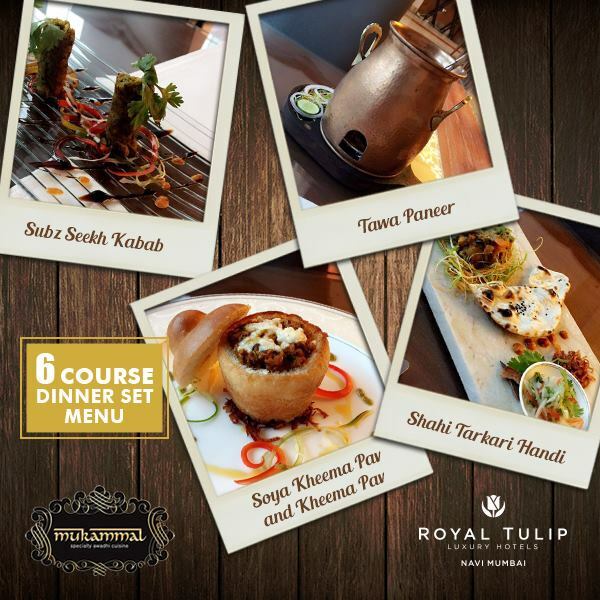 Follow Royal Tulip on Facebook to stay tuned for the latest updates and offerings! IskiUski is one of the online foremost jewellery shop in india with the latest jewellery design in Gold, Diamond, Silver. We offer wide range of white diamond earrings from various famous designers. In a country like India, vastu knowledge is considered one of the basic requirements while constructing a property or building according to pre-specified principles. It is necessary to follow these principles for wealth, health, fame and prosperity in life. Though it has become difficult to follow each and every principle in the present era, it is important to make maximum use of tenets in order to achieve peace and harmony in life.